Finally, the handbook you’ve all been waiting for! It’s like having me at your finger tips, without having to book an appointment! The Closet Smarts philosophy of dressing any body well, has been set down in print for your perusal and I hope you will take advantage of it! Not that I don’t still want to come to your house and peer into the depths of your wardrobe personally, but I thought it might be handy to show you your selves – in a more realistic way than is often portrayed in the fashion media. Here is a start down the road to developing your own impeccable style, which begins for everyone with finding the right fit. As I have always said, whether you are a size 2 or a size 24, you can look good in clothes if you learn how to pick the right ones. Whatever is going on underneath is your business, but no one else has to know. Your knobby knees and thunder thighs can remain your dirty little secret! I hope you will invite me and these 10 lovely ladies of all shapes and sizes into YOUR home, and start ridding yourself of ill fitting clothes once for all. Remember, the problem is NOT your body, it is truly ill fitting clothes. 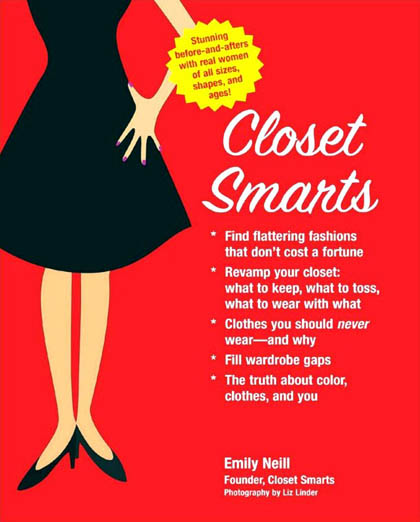 Take it to the bank, and order your copy of Closet Smarts right now!